Vulcan solar park feature is shaped like grain elevators. It seems fitting that Vulcan, Alberta, is home to the first solar park in Canada. After all this small town of fewer than 2,000 people loves making science reality out of science fiction. They built a replica Starship Enterprise and a space station-styled visitor centre while declaring themselves full-on Trekkies. 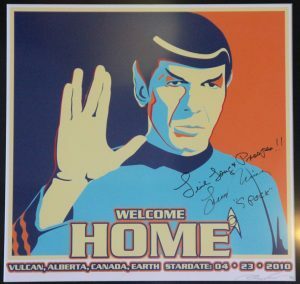 Vulcan is the Star Trek capital of Canada, so it’s not surprising we got a “live long and prosper” from Mayor Tom Grant soon after we arrived. Mr. Spock himself, Leonard Nimoy, visited Vulcan in 2010 to pay homage to the town and its fascination with all things Trek. Let’s face it, if not for the Star Trek theme, Vulcan would probably be known more for its A&W and gas station along Highway 23 than anything else. But the town is much more than that. There is a spirit and pride of place here. The town has embraced the seeming contradiction between its rich, agricultural history and space-age theme. For many, the term solar park conjures images of PV modules looking up from a utilitarian field. But this park is first and foremost a place to relax and play. “We were looking at developing a showcase for renewable energy, but we wanted to incorporate that into the community,” says Kyle Green, Vulcan’s project manager for the solar park. Formerly a fenced-off brownfield, the site used to house an old bulk fuel sales business. 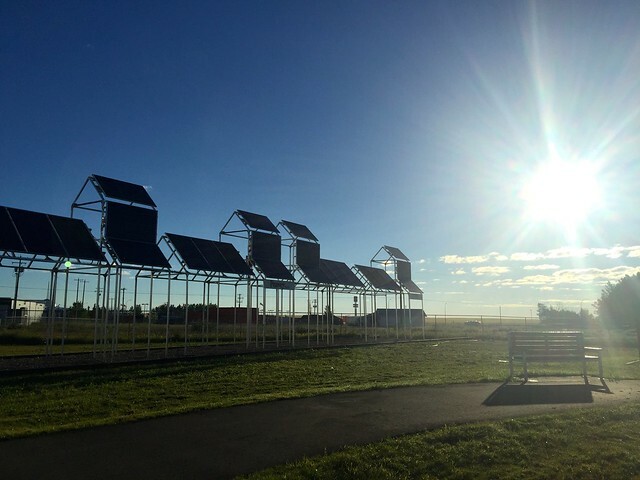 Today, the site is home to green grass, an artistic assortment of solar installations, and a row of solar structures, which were designed resemble grain elevators. This solar installation concept of nine-in-a-line grain elevators came from local students. It pays homage to Vulcan’s history as a major grain shipping centre with nine grain elevators in a row along the CPR railway line. 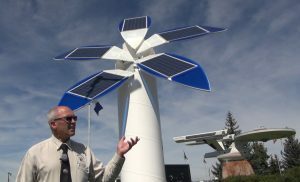 “The solar panels on them produce electricity that goes back into the grid and kind of gives you an idea of what the nine-in-a-line would look like,” says Tom Grant, mayor of Vulcan. The solar system is only 23 kilowatts, enough to power two to three homes. However, energy production was not the primary goal for Vulcan's solar park. Rather, the town wanted to create a green space out of a brownfield, educate people about solar energy and create a pleasant park space for residents and visitors alike. “The solar park is right downtown in Vulcan. And another side to that is the aesthetics,” says Kyle Green. Before the solar park was conceived, Matt Orr, son of a local businessman raised money to design and build a solar tree. It now sits close to the Starship Enterprise replica along the highway, a harbinger of the solar era that is dawning. Vulcan’s solar park was a unique way to build a park on a brownfield, showcase solar energy production and play off the town’s Star Trek theme, but Vulcan Country could also soon be home to a couple of very large solar projects. EDF Energies has proposed to build a 77 megawatt solar project that would occupy six sections of land at the south end of Vulcan County. EDF is in a partner with Enbridge in the 300 megawatt Blackspring Ridge Wind Farm already built in the same area. Enbridge has plans to construct Alberta Solar One, a 10 megawatt solar project. This will feature Morgan Solar’s Sun Simba solar concentrating modules, which use a dual-axis sun-tracking system. Altogether, 372 megawatts of solar are in the planning stages for Alberta. This will increase the Alberta's solar capacity 37-fold. Of course some of this solar prospecting is in part dependent on the shape of Alberta's upcoming solar support programs. The province plans to replace coal-fired electricity by at least 30 per cent renewable energy before 2030. And this kind of stunning growth is even more dramatic globally. The Dubai Electricity and Water Authority has just received a bid to develop 800 megawatts of solar for US 2.99 cents per kilowatt hour. It’s part of a plan to develop 5,000 megawatts of solar in the Mohammed bin Rashid Al Maktoum Solar Park. Back in Vulcan we're in the visitor centre, which welcomes 12,000 to 17,000 visitors each year. Karen Haller with Vulcan Tourism shows off a memorial display for Star Trek creator Gene Roddenberry. Rod Roddenberry, Gene's son, came to Vulcan dedicate the memorial to him. 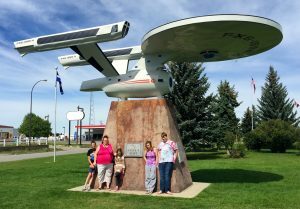 Be sure to visit the starship visitor centre and museum in Vulcan, Alberta. Consider going during VulCon, their annual Star Trek convention which runs July 21 and 22 in 2017. And don't forget to pick your own set of Vulcan ears at the visitor center!